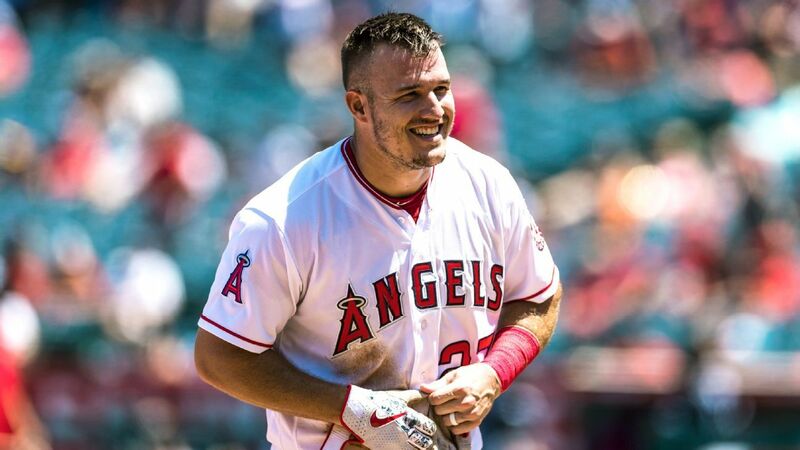 ANAHEIM, Calif. — Mike Trout and the Los Angeles Angels officially announced their 12-year contract, a record deal that keeps baseball’s top player with Los Angeles for what likely will be the rest of his career. Two-time AL MVP Mike Trout is close to smashing the record for the largest contract in professional sports history, as he’s finalizing a new 12-year deal with the Angels worth more than $430 million, sources told ESPN. The deal is worth more than $430 million, sources told ESPN’s Jeff Passan on Tuesday, and is more than 30 percent larger than the $330 million deal Bryce Harper signed with the Philadelphia Phillies on March 2 and bests boxer Canelo Alvarez’s deal with DAZN by more than $65 million. Trout, who has won two American League MVP awards and finished second four times, will receive an average salary of nearly $36 million per year, topping Zack Greinke‘s previous record average of $34.4 million with the Arizona Diamondbacks. Trout, 27, was due to be a free agent following the 2020 season, at which point he was expected to set off a frenzied bidding war among the large-market teams in the game. The clamoring already had begun, with Harper lobbying for Trout to join him in Philadelphia, 45 miles from Trout’s hometown of Millville, New Jersey. The Angels have nullified that possibility by ripping up the final two seasons of his six-year, $144.5 million deal and replacing it with the new 12-year deal through the 2030 season, sources told ESPN. The Angels now have two impressive cornerstones in place with Trout and AL Rookie of the Year Shohei Ohtani, who will return as their designated hitter at some point this season. Ohtani won’t pitch until 2020 after undergoing Tommy John surgery, but the 24-year-old two-way star is tied to the Angels for at least five more seasons. Information from ESPN’s Jeff Passan and The Associated Press was used in this report.